As the cold weather sets in, an outing that fits perfectly with this festive period is taking the kids to visit the relatives at Amsterdam EXPO. That is, their long distant relatives – the Neanderthals – who, research suggests, make up a tiny part of most of us. The new EXPO show, Giants of the Age Ice, brings you face to face with the massive giant mammoth and the deadly saber-toothed cat as well as exploring what life was like for Neanderthals 30,000 years ago. Research now suggests most humans today have a genetic pool comprised of 1-4% Neanderthal genes. It appears that as modern humans or Homo sapiens moved from Asia into Europe (30,000 years ago), the Neanderthal population living in this region was dying out. Some members of both species became sufficiently acquainted to mix the gene pools before the Neanderthals became an extinct species, leaving their genetic legacy to live on. Probably of more interest to the younger members of the family will be the skeletons, fossils and replicas of the animals from the period. 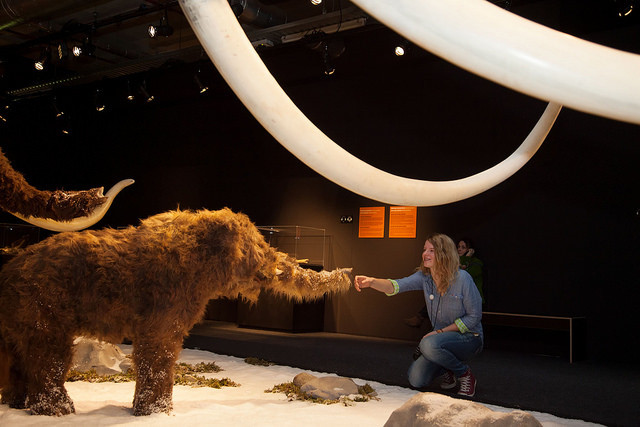 Giants of the Ice Age refers to larger than life familiar-looking mammals like the woolly mammoths, woolly rhinoceroses, saber-tooth cats and cave bears that feature in this travelling exhibition. They are not the cute, cartoon characters or soft fluffy toys that some children who have seen the Ice Age series of animated films may have been led to believe. Found in Siberia in 2012, a woolly mammoth skeleton estimated to be between 30,000 and 50,000 years old, has been reassembled from 215 bones (85% original skeleton) and is undoubtedly the star of the exhibition. 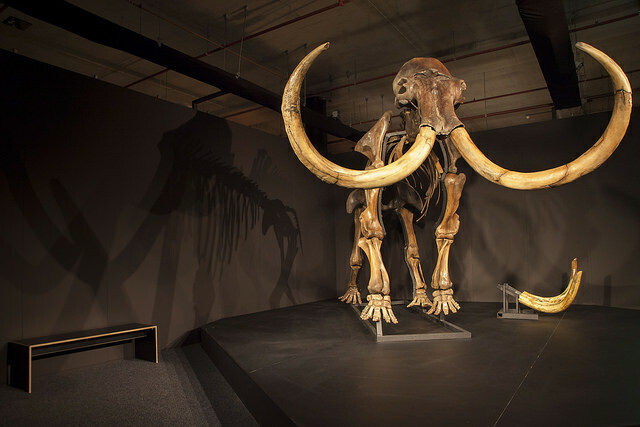 This mammoth skeleton, with its long tusks intact, stands proudly at three meters tall. Two preserved mammoth babies – Lyuba and Dima – respectively 37,000 and 35,000 years old, are presented in glass cabinets, maintaining the same position they have held since their premature deaths and burial in muddy bog holes. Another room contains life size replicas of two adults and one baby woolly mammoth adding further confirmation of the massive size and importance of this species. During this period rhinoceroses covered in fur also roamed the planet, very different from the leathery skin of their African counterparts, indicating that adaption was essential in surviving their environment. These woolly rhinoceroses were herbivores with two horns, the front horn thought to work as a snow shovel to help the animal get to the plants below. Saber-toothed cats were similar in size to the maneless cave lions present during this Ice Age. The saber-tooth cat sported a long pair of incisors thought to measure 28 cms in length. These teeth may have looked frightening, but acted more of a hindrance to the animal when catching their prey and were probably utilised only to deliver a well-aimed blow to the carotid artery or windpipe. The exhibition also includes photographs, sculptures and images of prehistoric art dating back 35,000 to 40,000 years. Although the art does not give any indication about the landscape, it does document the presence of animals including wild horses and bison, which can be used by researchers to learn more about the environment during this period. The exhibition is a wonderful experience that is sure to stimulate interest in this prehistoric time. As a complement to this show, a visit to Naturalis Biodiversity Center in Leiden, home to a complete gallery dedicated to the Netherlands in the Ice Age, is a must. This gallery contains numerous fossils found locally indicating that at one time mammoths may have made the crossing from Rotterdam to London keeping their enormous feet totally dry. Just imagine. Giants of the Ice Age runs until March 1, 2015. This exhibition is a collaboration between the Neanderthal Museum (Germany), MAMUZ (Austria), Museo Civico di Storia Naturale di Jesolo (Italy) and the host venue.